Available individually for the first time on DVD and Blu-ray! 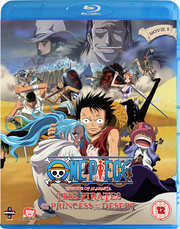 Eighth movie in the anime feature series based on the comic books by Eiichiro Oda. When the Straw Hat Pirates travel to Alabasta they discover that Crocodile (voiced by John Swasey) has used the influences of his criminal organisation Baroque Works to place doubt in the minds of the citizens surrounding King Cobra (Kyle Hebert)'s ability to rule. As the King's daughter Vivi (Caitlin Glass) fights to stop the impending revolution she teams up with the Straw Hat Pirates to try to restore her father's kingdom.